The international Conference is a Greek EU Presidency 2014 event under the auspices of the General Secretariat for Research & Technology (GSRT). 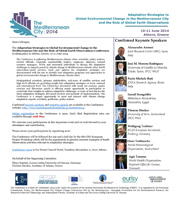 It is organised by the European Commission, the Eurisy, the Mediterranean City Climate Change Consortium (MC‐4), the Mariolopoulos – Kanaginis Foundation for the Environmental Sciences, the Research Center for Climatology and Atmospheric Physics, Academy of Athens and the Justus-Liebig University of Giessen. 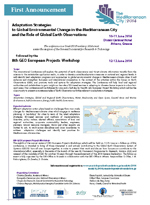 We invite you to join with others, work across disciplines and cross boundaries, and contribute your insights to address the adaptation challenges that Mediterranean-climate cities are facing, to identify best practices and adaptation options exploring Earth Observations and their potential. The conference is a Greek EU Presidency 2014 event under the auspices of the General Secretariat for Research & Technology (GSRT). 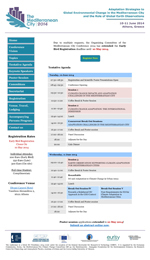 It is organised by the European Commission, Eurisy, the Mediterranean City Climate Change Consortium (MC‐4), the Mariolopoulos ‐ Kanaginis Foundation for the Environmental Sciences, the Research Center for Climatology and Atmospheric Physics, Academy of Athens and the Justus-Liebig University of Giessen. Copyright © 2014 Mariolopoulos - Kanaginis Foundation for the Environmental Sciences All rights reserved.